A high proportion of the 53 lots came from the 1930s, the so-called ‘golden age’ of the Kilburn workshops, and all bar four got away. With successful bids starting at £90 for a 1930s-40s bread board, collectors dominated the day, but the top-seller was a trade buy. A 4ft 9in (1.45m) wide panelled oak sideboard with cupboard doors and drawers with wrought iron handles and latches, it went well above estimate at £6800. A more contemporary look was a 1970s suede and felt segmented ‘caterpillar’ sofa in the manner of Swiss leather furniture specialists de Sede. With 14 seats, each joined by a zip mechanism and a maximum length of 12ft 4in (3.75m), the sofa had been bought new from north London contemporary specialist Oscar Woollens. It made £5000 at the sale on March 2. As at Roseberys' recent sale, one of the great names of French glass design caught the eye, that of the Art Nouveau Émile Gallé (1846-1904). Gallé, of course, spread his talents beyond glass to furniture and ceramics and it was an example of the latter which stood out at Leyburn. 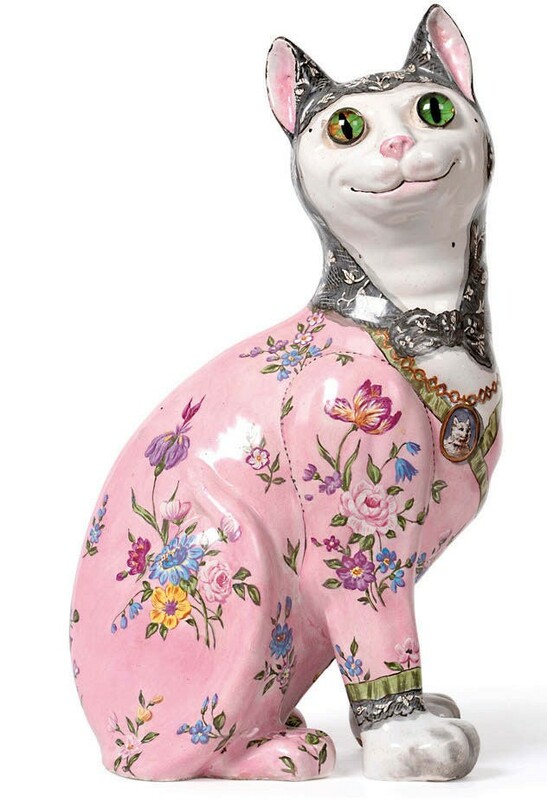 One of his popular polychrome faience cats, a c.1900, 13in (33.5cm) tall model with green glass eyes and dog-portrait pendant, bore the painted mark É Gallé Nancy. Estimated at £1000-1500, it sold at £3300.